Images above have been enlarged from original artwork in order to be placed on the wall in the photographs. For display purposes only. 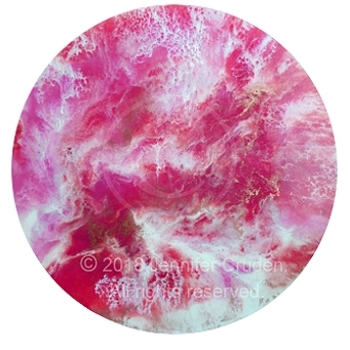 You will absolutely love these resin workshops. 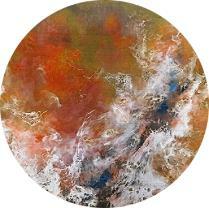 Your finished piece of artwork will be a one-off special item which you will be proud to show to family and friends. 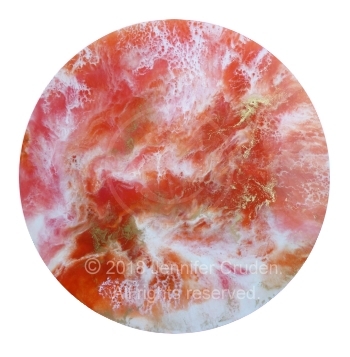 You will find resin art to be extremely addictive, love the unexpected results achieved and will 'just want more'. Safety - not just for myself, but also for those attending workshops with me. We will not be using an inexpensive brand of resin (some may do this, which will give off toxic fumes and yellow over time). 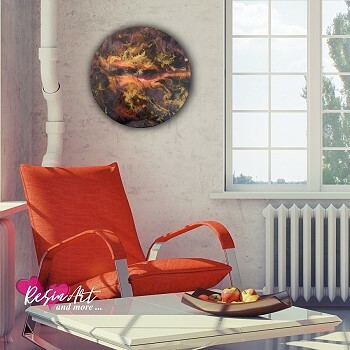 The resin we will use is a top of the range resin specifically made for art. It has no VOC, no smell and non-yellowing (uv) and claimed safe by the manufacturer. When being mixed with paints/pigments etc safety equipment is provided. Due to the makeup of this resin and, although advised 'safe' to use, when it is mixed with paints, fumes may be given off - whereas others may not use safety equipment I do - as it is better to be safe and look after ourselves for our health - than not. The 'introductory ' 1 and 2 sessions are to be attended prior to participating in other resin sessions. Prices include gst. This gives attendees the confidence to work their own designs in micas, golds and silvers on the larger pieces supplied in later workshops. All art materials are included in the price. Perhaps in one or two there may be just a couple of small items to bring with you, advised on booking. Send a message to book and take time out using an unusual product - you will love the end result. For details/info on other workshops please view the home page. 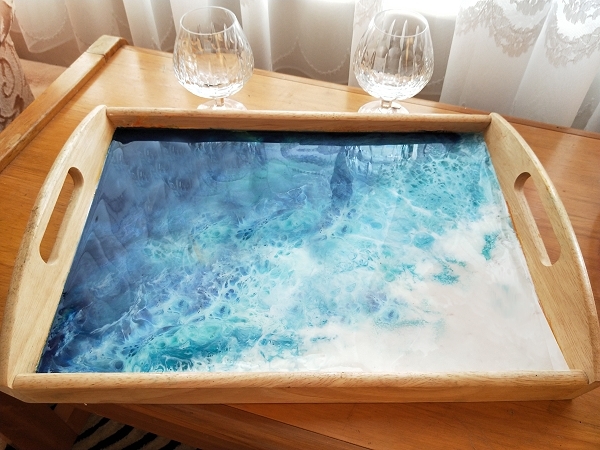 Like to create your own resin artwork? If yes, then these will be for you. 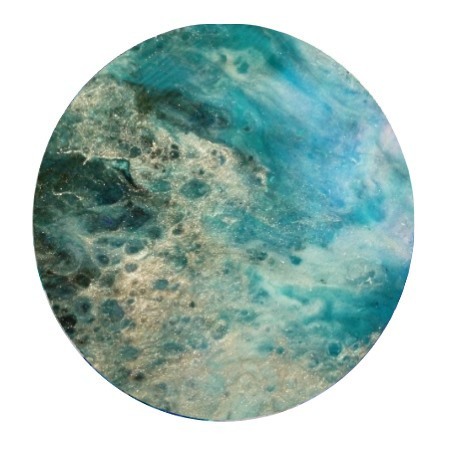 The 'introductory resin workshop 1 and also 2 ' will have a duration of approximately 3 hours plus/minus which will include a demonstration at the start of the session prior to attendees commencing their own resin art. Will be shown how to mix, add colour and pour your own designs. Explanation of safety and other items necessary when using resin and other items will be explained. Please note ... If you wish to undertake other resin workshops, then these two initial ones are to be attended first, prior to participation in others. This ensures you will be confident designing on other pieces later on. 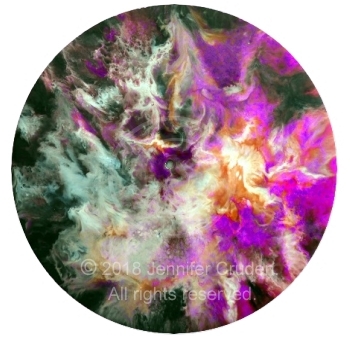 The price includes all art materials with primed round board or canvas - unless otherwise specified. Also note ... Safety equipment (including a mask) is supplied to be worn when undertaking resin on the day. If you do not wish to use, then will not be accepted for these sessions. Likewise on the day, if decide not to wear the mask, then will be unable to continue, however, no refund will be given. Resin takes a minimum of 24 to 48 hours to cure - allow up to 5 days for hardness (or even more as is delicate). Please be aware when using a resined item, as it will be delicate as it is a type of plastic and can scratch easily. Collection of article the next day (or as arranged). 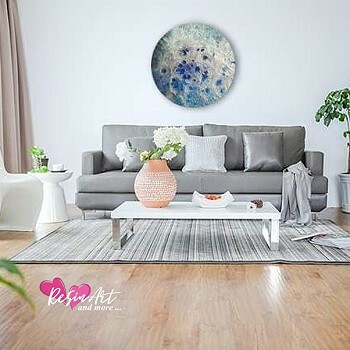 As resin has a chemical structure and we are mixing in paint/pigments as well as using heat, it therefore is not advised for women who are pregnant or those who may suffer from asthma or have other allergies to items. And, although I do have attendees plus myself use masks and other safety equipment, I do adhere to the above, as better to be safe for all of us than not. There may be others who do not advise this - but I do! Attendees must be 18 years and over. each day is totally separate to the other. 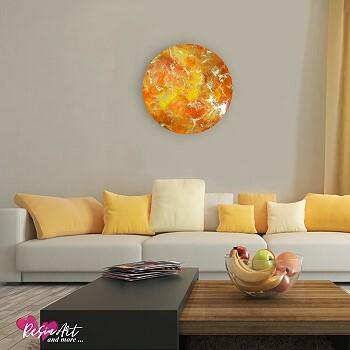 Work with high quality prof art grade resin, VOC free/UV protected. In this No.1. 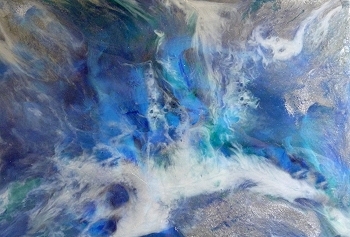 workshop you will work with high quality prof art grade resin, VOC free/UV protected. 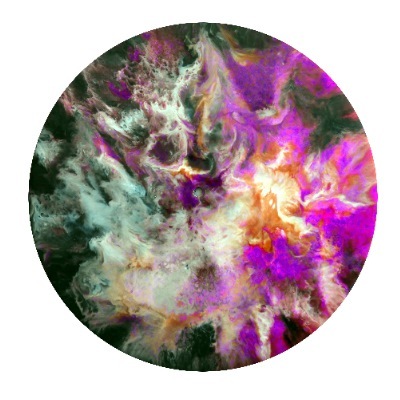 Mixing a few, or more - your choice of colours / using a hairdryer to produce your own gorgeous resin artwork to hang on your wall at home, as well as drink coasters to match. Please see note at bottom *. 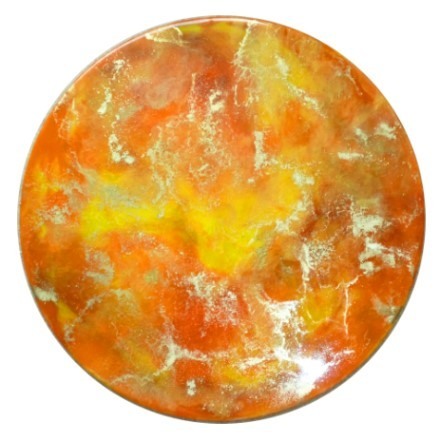 I shall be supplying another item for you to resin whilst in your 3rd workshop. Just my way of showing appreciation. I am sure you will be really pleased with this extra 'resined piece' for your home. Complete AFTER having attended Introd.workshop 1. Work with a high quality professional grade epoxy resin. Work with a few or many colours. In this introd. 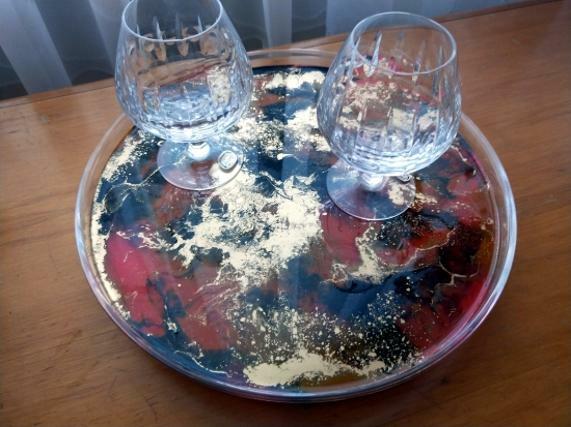 workshop No.2 - tray with 4 coasters, you will mix a few, or more colours - your choice of colours / using a different technique with a hairdryer and also use a flame torch on your resin to produce your own gorgeous one-off resin presentation tray with four matching drink coasters. Complete AFTER having attended both the 1 and 2 sessions. PRICE: $225.00 inc. Black or white Pleese advise which you would like to have. Use of all colours plus micas, golds/silvers/glitter to create beautiful art. 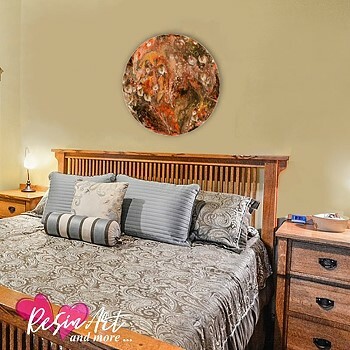 With this follow-on workshop you will work on a large round canvas, and able to choose any of the colours, as well as a variety of golds, silvers, coppers etc. 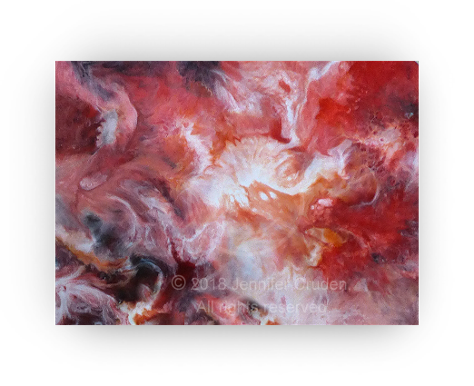 Thereby producing an amazing item to take home to hang on the wall at your home, or perhaps as a gift for a friend. With the prior experience of the first two workshops, this will be a thrill for you to achieve. PRICE: $225.00 inc. Black or white canvas, advise which upon booking. I shall be supplying another item for you to resin whilst in your 3rd workshop as a thank you for attending/loving my resin classes. Clock - Complete AFTER having attended both the 1 and 2 sessions. PRICE: $185.00 inc. INCLUDES clock parts. 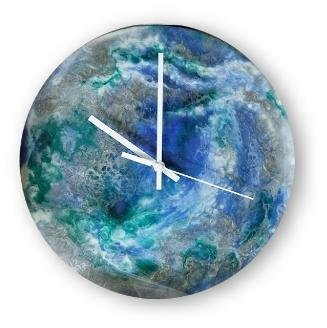 micas, golds/silvers/colours to create a beautiful clock. With the above Clock Follow-on workshop you will have a load of fun, firstly thinking of what colours you will be choosing, and then the design you would like to hopefully turn out. Having experienced both number 1 and number 2 intro workshops, you will now be more confident in the use of resin for this type of art. Using all colours available including glitters and micas. How to mix and work with a high quality professional grade (more expensive) epoxy resin, which is a VOC free and UV protected resin plus odourless. How to mix various colours into resin. 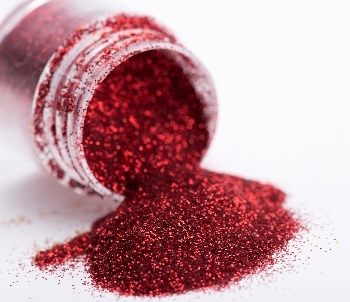 You will be able to select from a variety of coloured pigments, inks, pastes and beautiful iridescent, pearlescent and metallic powders as well as Mica pigments plus, of course, glitters (we cannot leave the latter out can we?). How to use different tools in your resin. We will be using heat and other items to produce different effects in the resin. Shirt with long sleeves which closes/does up at wrist. Do not wear fluffy jerseys etc as may drop into resin and long hair best to be tied back. Comfortable shoes as may be standing a little. The substrates provided to you to paint on for the sessions will be given, by myself, one or two prior coatings before you use. Although not done by many, as I do this for my own professional work, I feel I also wish to provide a better service to all attendees and therefore spend the time to undertake this for you as well. I personally just feel that the little bit 'extra' I do will pass on to yourselves as well to do, and for you to be happy with the service which I provide.